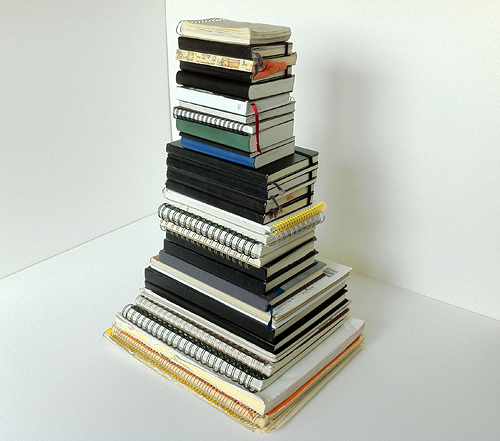 Back in 2008, Michael Bierut wrote an excellent post on Design Observer about his collection of notebooks — how he started, what kind he uses, what purpose they serve. 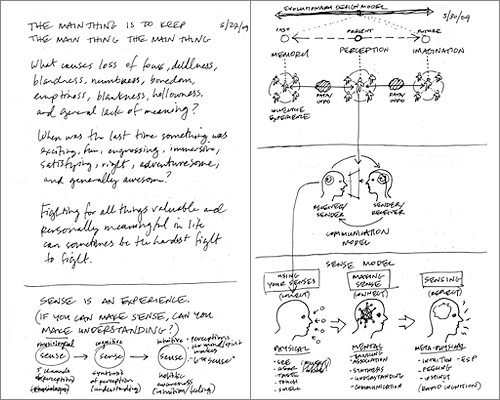 His reflections on note taking and the habit of recording thoughts regularly on paper stuck with me, not just as an insight into his creative process, but as a motivation to reflect on my own relationship with my sketchbooks. I have been drawing my entire life. 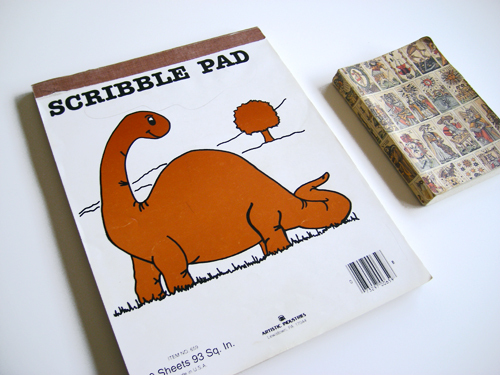 As a child, I drew on whatever paper I could get my hands on: notepads, copy paper, legal pads, napkins, envelopes. 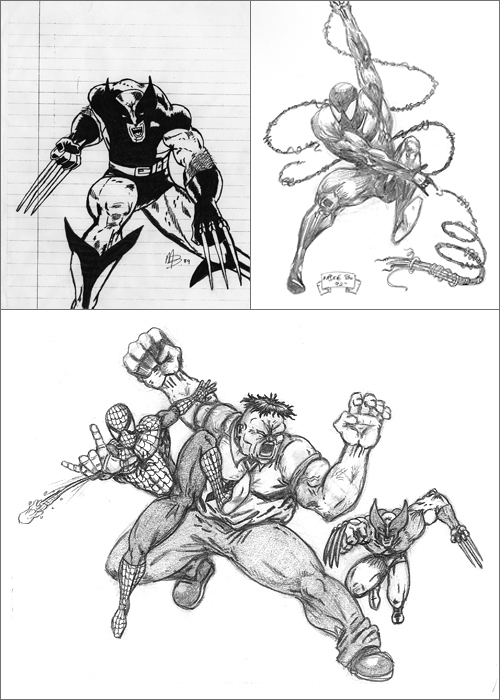 Cartoons and comic books were my inspiration and my “goal” as a young artist. I would spend hours recreating scenes from my favorite shows, like Voltron and the Thundercats, or tracing panels from Fantastic Four and Wolverine comics (among many others). Over time, I accumulated a lot of paper of varying sizes and types, which I eventually kept in a portfolio. 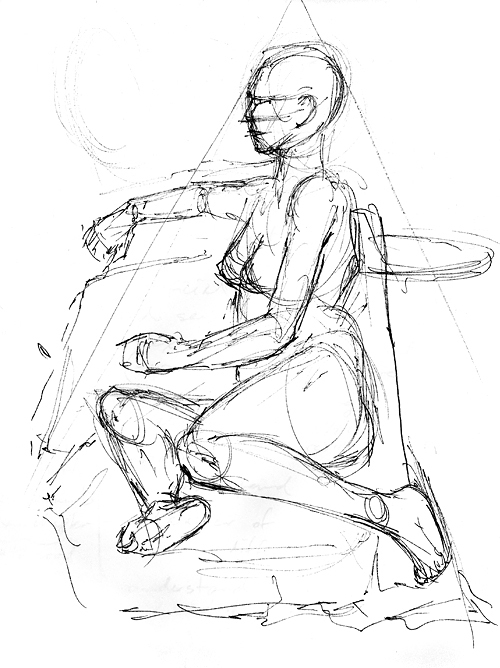 But I came to realize that this method would prove inefficient if I was to take my drawing more seriously. I started keeping regular sketchbooks around the age of twelve, but exactly how I came into possession of my first one escapes me (it is likely that my mother or my cousin may have bought me my first official sketchbook, which I no longer have). My earliest sketchbooks were large, back when scale mattered more than portability, and they were usually cheap Aquabee drawing pads with coarse-tooth paper. When I got tired of pages falling out from constantly folding them back, I switched to higher quality Strathmore and Canson sketchbooks with smoother, brighter paper and sturdier binding. I’ve never stuck exclusively to one particular brand or style of sketchbook. I like holding a different book in my hands every now and then, perhaps to make me feel like I’m producing new thoughts and ideas. My only lasting criteria for a sketchbook are that the pages be free of lines and that the paper accept ink well. I make exceptions only under special circumstances: when I want to do guilt-free experimentation, when I find a handsome sketchbook that inspires me, or when I receive a sketchbook for free or as a gift. My preference lately has been for the Moleskine Classic Large Plain Notebook because it’s just the right size for my needs, it withstands daily abuse, and it closes securely with the trademark elastic band. 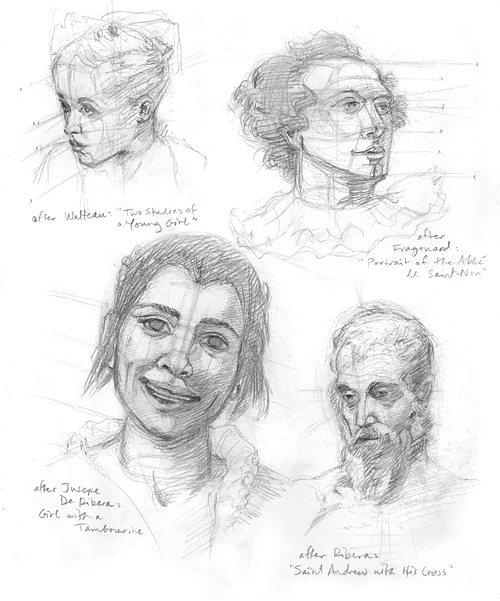 Anything goes inside the pages of my sketchbooks: if I can think it, I draw it. 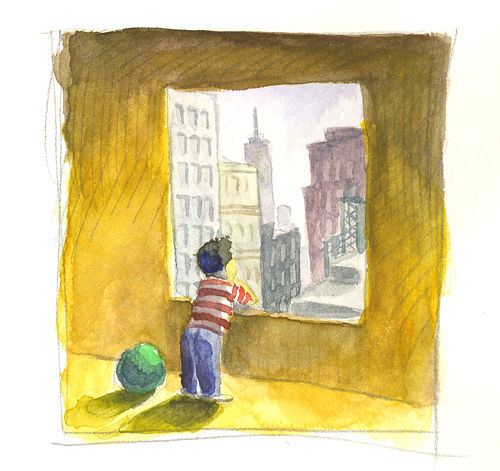 My early sketchbooks were playgrounds for my imagination, full of bizarre creatures, invented landscapes, idealized superheroes, and impromptu drawing lessons. Sometimes pages would be crammed with lots of little ideas, and other times a single small idea would occupy a page on its own. I would try out mixed media, watercolor, and collage on occasion, but I typically work in pencil or ink out of sheer immediacy — never in ballpoint pen. These days, my medium of choice tends to be a Pilot Precise V5 Rolling Ball, fine point, although any good rolling ball pen with rich black ink will do. 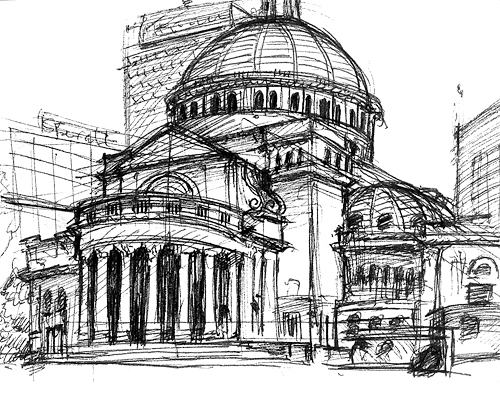 Drawing from life is one of my favorite activities, especially while traveling. I always try to carve out time to just sit somewhere and fill my sketchbook with observations of my surroundings, to impress them on my memory. Museum visits also allow me to engage in sustained, active seeing. Ancient artifacts, modern masterworks, and even museum spaces reveal hidden lessons only after lengthy analysis with pencil and paper. It often takes several tries and many pages for me to really understand what I’m looking at. 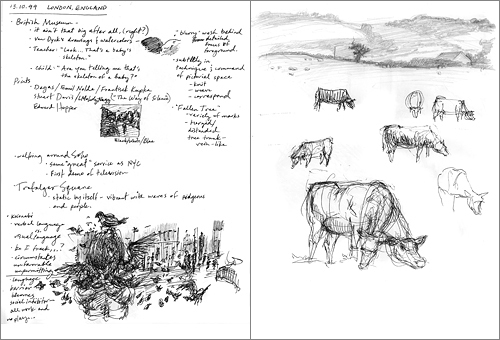 From the end of college up to the present, my sketchbooks have become less artistic and expressive in nature, more functional and diagrammatic. My information design and graphic design sensibilities took shape in the late 1990’s and early 2000’s through logo studies, thumbnails of page layouts, and sketches for personal portfolio projects. 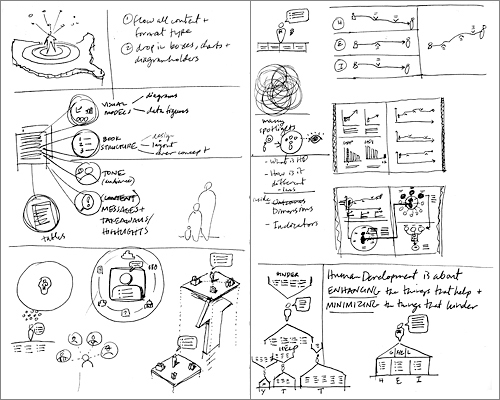 I mainly use sketchbooks now for project work, to capture notes from meetings, construct concept models showing relationships between ideas, or figure out how to represent data. My most productive work moments typically happen during my morning or evening train commute, and only occasionally at the office. With headphones on and a block of uninterrupted time (usually 20-30 minutes), I am able to dive into a problem in my sketchbook and rapidly explore every angle. 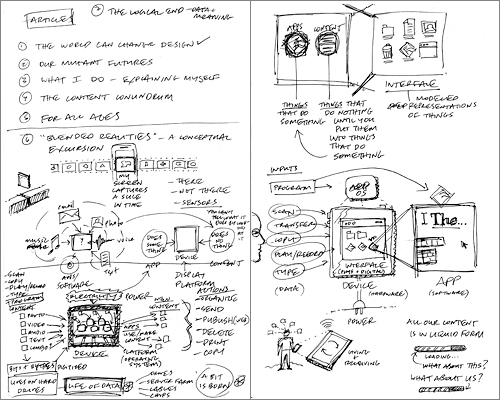 I enjoy looking back at old project sketches and seeing how my thinking evolved on a particular diagram. My first attempts are never successful. 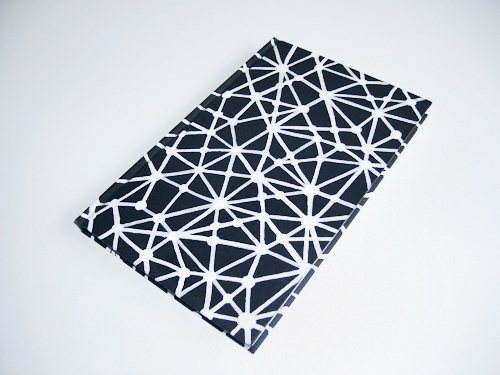 My sketchbook also serves as a journal when my mind needs an outlet for non-work thinking. I rely on words for the most part, but I also try to create simple pictures when it helps me put different ideas together. Sometimes ideas will carry over from one sketchbook to the next as new ideas emerge, in which case I rewrite or redraw the relevant bits. The role of sketchbooks in my life has evolved considerably, although I long for simpler times when the only purpose I had was to let my mind wander. Creative freedom took on a much different meaning in my childhood than it does today. For all the latitude that design work affords me, I still feel that my most recent sketchbooks and drawings represent a form of commercial art — artistic production in the service of business. That, fundamentally, is the nature of my work (though not it’s sole purpose), and yet it has led me further away from what compelled me to start drawing in the first place. The tension I feel between “formal” art and “functional” art is something I hope to explore in my current sketchbook. I want to revive old ways of seeing and creating and allow them to coexist with and even inform my more structured design work. For me, truly fulfilling art work is a convergence of deep concentration, visual reasoning, and artistic production — without the pressure of time, intent, or anticipated outcomes. The state of flow, as described by Mihaly Csikszentmihalyi, came naturally to me in my childhood, but as school and work grew to dominate my life, it became harder and harder to evoke. Collage, for instance, is one means of rekindling flow: it allows me to experiment freely, make spontaneous associations, and assemble my thoughts easily with a minimum of craft. Through this form of “play,” I can break conventions that have become ingrained in my drawing habits and open up more possibilities in how I synthesize information visually. 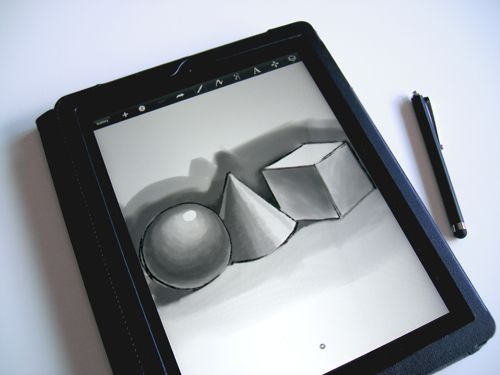 As comfortable as I’ve become with ink on paper, I am very curious about the role of devices and software in extending or redefining the sketchbook. I have tested countless drawing apps on my iPad, and while a handful come close to simulating real-live drawing (Bamboo Paper, SketchBook, Procreate, and more recently, Paper), the experience is still rife with shortcomings: the clumsiness of using a nubby stylus, crude recreation of different media, and unnatural control of the page/canvas (never mind the lack of tactility). Still, those don’t deter me from continuing to test them out and finding ways to fold them into a digital design workflow. Technology will eventually open up new creative possibilities beyond what we can imagine today, but for the time being, I’m quite content pushing the boundaries of a good old-fashioned bound paper sketchbook. I really enjoyed this. You transported me through time and space — just the kind of thing I love about a good, true piece of writing. As promised, here’s my contribution (http://chrbutler.com/post/20464816294/my-books). I think the subtext in writing about one’s sketchbooks and sharing pages is that there is omission as well, a selective transparency. While I went for a high-level survey, much like Michael Bierut’s post, there is always much more to the story: the inner life that sets the context for what appears on paper. Your post tells that textured story with honesty and courage. There is no mistaking the aspirations and struggles that live behind and within the pages of your books. One shared topic will likely figure strongly in the next wave of output: the tension between the inner and outer self manifest in how we use analog and digital media. I’m eager to see where that exploration will lead, in the #yellowbook and elsewhere.